Located in downtown Sumas Washington. Just 3 blocks south of the Huntingdon border crossing. Pick them up in person. Have your items placed in an After Hours locker. From the time we receive our shipments right to when you pick it up, all our packages are individually tracked by it's barcode for security. We verify your identity, or anyone you add to your authorized list, before giving out your packages. We ship out packages as well as receive them. We can ship via Fedex, UPS, or USPS. We accept cash in both Canadian & US funds, (just not pennies). We can even give you back Canadian change. We also accept Visa, Mastercard and Canadian Interac debit in Canadian funds. 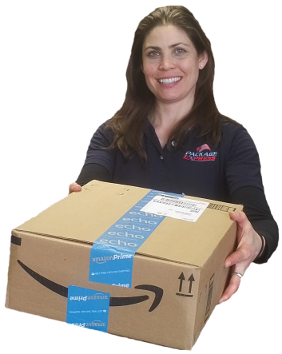 Ship all your packages and mail to us, then decide if you want to pick it up during business hours or after hours. Sign up with us to register your contact information. It's free to sign up. You'll be instantly given your unique customer number and address to ship all your purchases to. As soon as your package arrives, we'll send you an automated notification email. Then you can pick it up, or request to have it forwarded, or placed in an After Hours locker. Just log in to your account and request which evening you would like to come. We'll place your packages in a locker and send you the security code. See our FAQ on how it works.